Note: Last year he won the Frank Gomez Memorial, the Dr. Fager, the Affirmed, and the In Reality Stakes (100 Beyer) all at Calder. 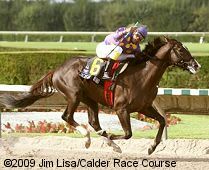 He was sold to Robert LaPenta and sent to trainer Nick Zito at Palm Meadows. In his first start for his new connections, he finished second in the Holy Bull Stakes (G3) at Gulfstream on January 23, earning a 90 Beyer. Finished second in both the Fountain of Youth (G2) on February 20, and in the Wood Memorial (G1) at Aqueduct on April 3. In the Kentucky Derby he was 12th beaten 19 lengths, then came back to finish 3rd beaten just 3/4 length in the Preakness.